Nicknamed “ Beton (Cement) Mustafa” (1926-2005), the powerful midfielder brought a physical presence to Black Eagles. His never-say-die attitude and tremendous work rate won a lot of games for the Black and Whites. 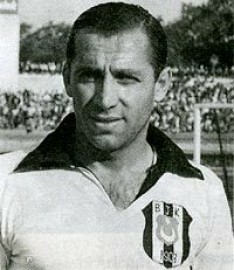 Ertan came to prominence with the Army teams, and in 1959, he resigned from the Army with the rank of Captain to join Beşiktaş JK. He was a member of the 1960 Turkish National League championship team. Beton Mustafa earned 86 international caps with Turkey. After retiring, he coached Turkish clubs PTT, Hacettepe and Bursaspor.